Virgin queens are sexually mature and ready to mate within 5-6 days of emerging from their queen cell as an adult bee. They then have four weeks to find some suitors; after that period they are no longer able to mate. As long as the weather is warm enough (preferably between 21 to 27°C and little cloud cover) the queen will go on one or more mating flights. She is encouraged out by the workers, who may treat her roughly by vibrating her up to 1200 times an hour or pulling at her wings. She is no one-man romantic; quite the opposite, she likes to have liaisons with as many drones as possible, mating with an average of around 13 in total. Drones from several hives, up to 6km away, will fly up on a sunny summer day to await their fate in drone congregation areas (DCAs) 10-40 metres above the ground, much higher than foraging worker bees fly. There can be as many as 10,000 drones in a single DCA and there are usually several DCAs for a Queen to choose from within flying distances of apiaries. Drone flights take place in the afternoon, generally beginning about one hour before virgin queens take their nuptial flights (Ruttner 1966). When drones reach the congregation areas, they remain flying in wide loops until they are depleted of energy stores and need to return home to feed. Only queens within the areas attract their attention; outside of the areas, virgins are ignored (Ruttner and Ruttner 1965a, 1966). For a rare film of drones whirling in the air after the queen, see this Russian YouTube video: www.youtube.com/watch?v=hAzZHdX0k2E. There are still many unanswered questions as to how the drones decide on the DCAs, but each generation of drones certainly seem to choose the same spot year after year. There is a DCA over Selborne Common in Hampshire (south England) that was first described by the well-known naturalist Reverend Gilbert White in the 1700s. It still reappears in the same place each year and can easily be heard on a fine summer’s day (A Practical Manual of Beekeeping, David Cramp, 2008). How do the drones find the DCAs? Older boys cannot be showing them the way, as any drones still alive and unmated at the end of the mating season in autumn are turfed out of the hive by the workers, to die of exposure and starvation. The DCAs tend to be over open ground and sheltered from the wind, but some are not. 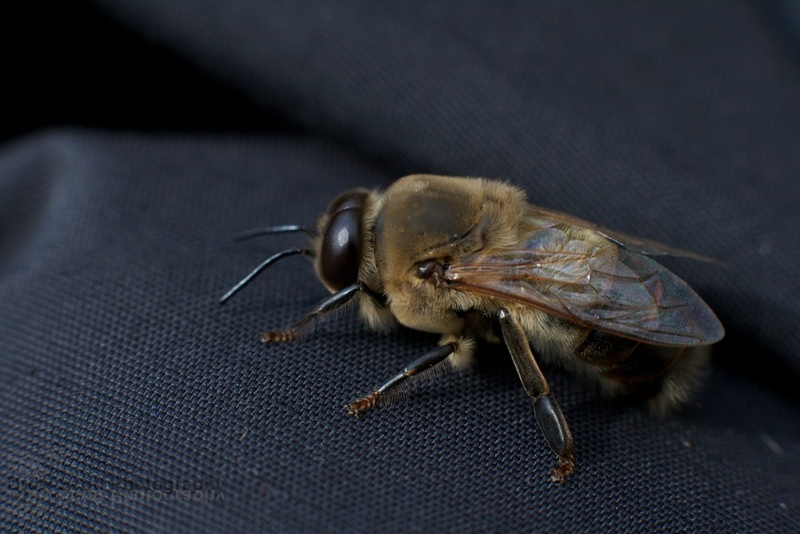 Following experiments with a queen pheromone lure on an extra-long fishing rod in 2015, beekeeper blogger Turlough concluded that “A local rise in the land, no vertical obstructions and the presence of a breeze” were common features of the DCAs he discovered (In search of drone congregation areas’, Turlough, Beecraft magazine, December 2015). It’s even possible that the earth’s magnetic field is important, as drones develop large quantities of magnetite in their abdomens (magnetite is a naturally magnetic iron oxide which can respond to magnetic fields). It is an area of bee behaviour which could do with further research. The congregating suitors are attracted from several metres away by a virgin Queen’s pheromones (from her mandibular glands within 100m & tergite glands within 30cm), forming a black drone ‘comet tail’ behind her as they chase her though the congregation area. Drones also have huge bulging compound eyes which help them spot as well as smell the Queen. Then comes the exciting bit – when within sight of the Queen’s behind, a drone will approach from below to catch the queen with his legs, impregnate her and then flip back, breaking his endophallus which explodes spectacularly, releasing his sperm into the Queen’s sting chamber. How a drone looks post mating…. It’s all over for the drone within seconds, and he falls to the ground dying. I can’t help wondering – does the drone anticipate his fate? Or does it come as a bit of a shock? Amazingly, the drone’s left behind endophallus in the queen’s sting chamber glows, emitting ultraviolet (UV) light which attracts other drones to come and get her. See Chris Slade’s Bee Blog for a spectacular sonnet on the life and unfortunate death of the drone (I’m nearest, what is there to lose?/Got her! I’ll mate with all my might/WOW!!!/OWWW!!!!). Immediately after mating, the oviducts of a queen contain an average of 87 million sperm and a maximum of up to 200 million, although when full her spermatheca contains only 5.3 to 5.7 million sperm, which represents contributions from all the drones which have mated with her. Intriguingly, research has shown that worker bees back in the colony will pay more attention to a queen that has mated with a large number of drones than to one which has mated with fewer, and that they will more readily accept her – there are pheromonal differences which they can detect. The queen will lay between 175,000 and 200,000 eggs annually, so as long as she is well mated the sperm she receives as a young Queen lasts long enough to fertilise worker eggs for the rest of her average lifespan of less than four years. So she can grow eggs in her belly. What else could she do, without telly? ‘Rediscovering the first drone congregation area‘, Turlough (vita-europe.com, August 2015 blog post) – includes a nice recording of the sound of the drones and links to other posts in the series. This entry was posted in Bee biology, Exams, Queens and tagged drones, mating, Module 6, pheromones. Bookmark the permalink. Try everting a drone and putting the sperm under a microscope. Each one has a spectacularly long tail. Why? The tails aren’t discarded when the sperm has made its way into the spermatheca and they take up quite a bit of space. This doesn’t seem very efficient, which is unlike what you’d expect, so there must be a reason for it which is yet one more thing we don’t understand about these mysterious creatures. Thanks for your comment Chris. Could the long tail be an evolutionary advantage for sperm – perhaps the longer the tail the faster they can waggle in front of other drone sperm into the spermatheca? There certainly is so much more to learn still. I was blown away when I found out about the glowing endophallus!